The Get(WindowContentHeight) function will return the vertical content area (in pixels) of a current FileMaker window. One key thing to notice in the context of this function is the word “Content”. 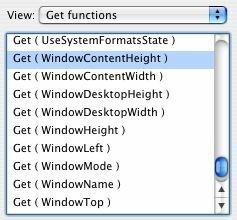 That is to say the Get(WindowContentHeight) function includes the height of the area in which the layout window includes the fields, buttons and other layout objects. The result of the Get(WindowContentHeight) function does not include the area used by the status area, title bar or the right and bottom scroll bar area. The Get(WindowHeight) functions returns a different value than the Get(WindowContentHeight) function. It will return the total height of the current window, not just the content area. The Get(WindowContentWidth) function will return the horizontal content area ( in pixels ) of a designed FileMaker layout. One key thing to notice in the context of this function is the word “Content”. That is to say it includes the area in which you add fields, buttons and other layout objects. It does not include the area used by the status area, title bar or the right and bottom scroll bar area.